The Scotch Essentials Easy Fix Button works like a charm. Easy to follow instructions and application and as stated, a no-sew way to reattach or add buttons. The buttons are a standard button size for most dress shirts and I happen to have a shirt with a missing button. I gave it a go and it did the job, the button stayed on the adhesive part of the pin which stayed on the pin all day. The only difference was the colour of the button and the fact that the button just "magically" holds on its own without any stitching (see picture). I really love the idea of the Easy Fix Button as the pin can be reused time and time again, just remember to remove the pin before wash. Might I add, how cool would it be if they sold only the pins with the adhesive? Lets face it, not all buttons are the same, I would love the apply my own buttons using the pin. 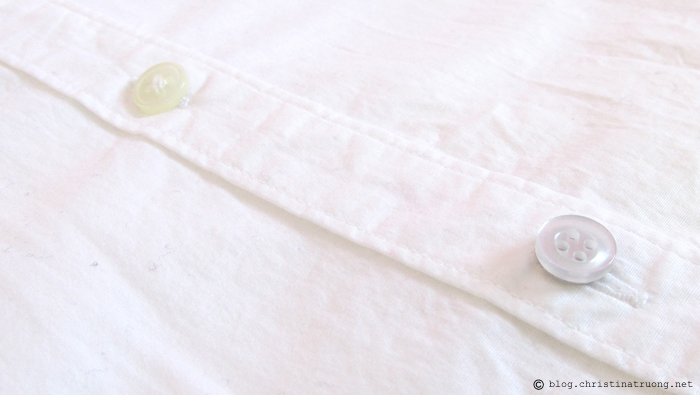 A great product to throw in your bag for those unexpected times a button goes off missing. I have a midi skirt that I always thought would look great for the colder season with boots if only I could temporary shorten it slightly. I've looked at tons of how-to's online but was still hesitant that I will make a mistake and destroy everything. Thankful for Scotch Essentials Adjustable Hem Tape I went right into work! Easy instructions to follow: simply turn your item inside out, measure and fold hem into fabric to form a crease, tape, and press firmly to ensure hold. Volia! I managed to turn my midi skirt into a knee-length skirt! The tape stayed on the entire day and removing the tape at the end was not a problem. Super satisfied with the Adjustable Hem Tape. Whether you're a pro at sewing or not, I highly recommend this product - easy to use and gets the hemming job done within seconds! The price is very reasonable. 30 strips for under $10, that in itself is cheaper than getting one item hemmed at the tailor. Highly recommend this product, just a few notes, make sure it's the item you absolutely want hemmed and take the measurements VERY seriously. Seeing the product with the word "permanent" I did not want to take any risk and make mistakes as it may be permanent if the product works. And permanent it was, no turning back - which is a huge shocker as I didn't think it was possible. In terms of application, patience and caution is key, the strips are really sticky and again, there's no turning back. I used the Permanent Hem Bonding Strips for my beloved jeans that I love but always have to fold up when wearing (Hashtag: short girl problems!). These strips does the trick and I can finally wear the jeans happily. Even after putting them into the wash they turned out fine. This shorty is satisfied with the Permanent Hem Bonding Strips! Comment below: Have you tried any of the Scotch Essentials Brand? What are your thoughts on these products? After reading this review, would you purchase Scotch Essentials and do these fixes on your own or will you continue to take it to a tailor? Disclaimer: Products received complimentary from ChickAdvisor for testing/review purposes. Views expressed are of my own.